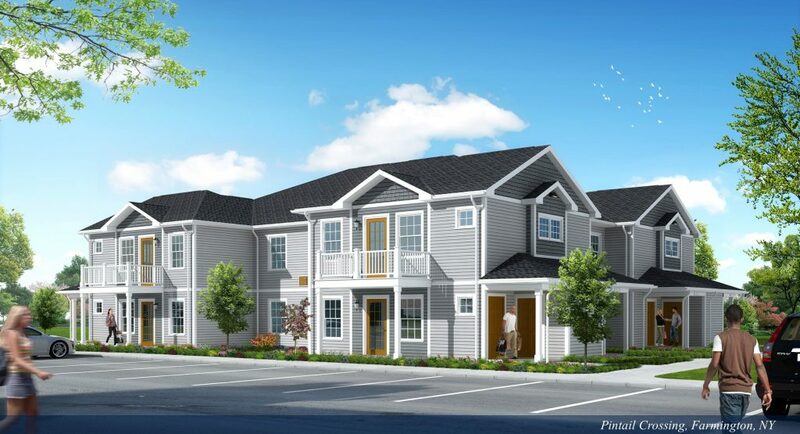 Farmington, New York, April 1, 2019 – Conifer Realty is pleased to announce that Pintail Crossing located in Farmington, NY is opening this month with move-ins expected by end of April! Pintail Crossing is a brand-new, energy efficient, affordable apartment community perfectly located on County Road 41 within the Victor School District, where residents are just minutes from shopping, schools, restaurants, and the Interstate. The community offers spacious one, two- and three-bedroom apartment homes designed for families, offering the convenience of location and upscale amenities. Pintail Crossing features a beautiful clubhouse with Great Room, perfect for entertaining, a fitness room and laundry center. Apartments are available to accommodate the Hearing and Visually Impaired and disabled accessibility. Pintail Crossing is filling up fast, are a few two-bedroom apartments still available. To reserve yours today, call (585) 407-1108 or visit pintailcrossing.com for more information and to download an application. Don’t delay, apply today and picture yourself living at this beautiful community! Please do not visit the construction site, there is no leasing assistance on site. The interim leasing office is located at Brookside Apartments, 2883 Conifer Drive, Canandaigua, NY 14424.